Your Local Living Moment: Boat ride to Nubian Village with Traditional Meal, Aswān Your Discover Moment: Aswān. Guided tour of the Pyramids of Giza and the Sphinx. Orientation walk through Cairo's Khan el-Khalili bazaar. Free time in Aswan. Felucca Overnight Sailing Excursion including support boat. Kom Ombo Temple visit. Free time in Luxor. All transport between destinations and to/from included activities. Spend another day exploring Aswan. Opt to visit one of the most fascinating sights in the area, the Temple of Abu Simbel. Or continue exploring the city to learn more about Aswan's local people. Additional Notes: If you have purchased the Temple of Abu Simbel Overland Theme Pack, you will visit the temple today. Leaving Aswan at around 4am, you travel deep into the desert to the site of these enormous temples, on the shores of Lake Nasser. 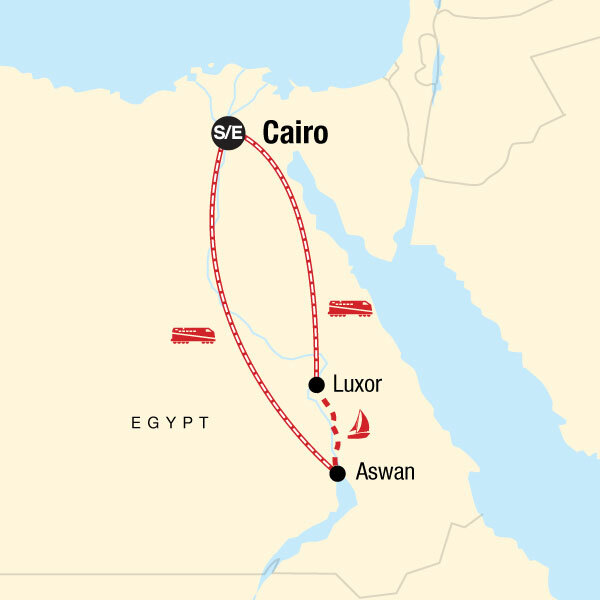 You can spend around 2 hours at the temples and then return to Aswan by about 12pm. The round trip drive is around 5-6 hrs. This trip has a "Basic" Service Level grading. The accommodation is clean and centrally located but very simple. Your room will have an en suite bathroom, air conditioning and a basic breakfast will be provided.